You are here: Home » Columnists » No Time for Lenten Services? Use the Drive-thru. No Time for Lenten Services? Use the Drive-thru. A little cramped for time this Ash Wednesday? No problem. An Ohio Methodist minister, Rev. Patricia Anderson Cook, has found the solution for busy Christians on this holy day: Drive-thru ashes and reflection. From 5-6pm EST on Ash Wednesday, Rev. Cook, pastor of Mt. Healthy United Methodist Church, will be out in her church parking lot offering Lenten Ashes to anyone who’d like them. Yep. You can stay right inside your car, receive ashes, a church brochure, and a reflection booklet to read…when? On the way home? Rev. Cook also told the Enquirer that she knows of no other local churches providing this service, but thinks maybe they should. I appreciate the creativity of Rev. Patricia Anderson Cook. After all, denominations of every sect must find new ways to reach out to existing and potential congregants in order to survive. I also appreciate Rev. Cook’s energy and effort to…err…spread the ashes as far and wide and she is able in order to draw folks into Lenten observance. However, I do cringe at the thought of “fast ashes” modeled after the innovation of “fast food” in our country. Convenience food chains such as McDonald’s, Burger King, and Taco Bell (among others) have made it ever-so-easy for consumers to grab a meal (I use that term lightly, here) and go. That’s fine when you really are on an impossibly tight schedule and have no other options. But, think about what’s happened to this country since the onslaught of drive-thrus? As a culture, we stopped eating meals together except on special occasions, lost sight of the value of family dinners, quit taking advantage of an excellent way to reconnect and recommit, and began caring less about what we eat and how it’s prepared. We let a vital ritual slip right through our fingers. What once was a way to foster community – not just among families, but also among communities of many kinds – has become an oddity. When I think about drive-thru ashes, I wonder whether this innovation will do for church congregations what fast foods have done for the American family. There’s something about joining together as the Family of God as we embark on our collective Lenten journey in order to acknowledge our sinfulness, pray and sing together, give glory to God, support one another in our striving, and humbly and reverently receive the blessed ashes that are a reminder of our human frailty and need for God’s mercy. Ash Wednesday is about more than having a thumb-full of ashes scruffed across our foreheads. It’s about coming together as People of God to repent and recognize our hope in the Resurrection. 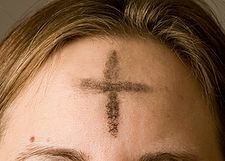 Having ashes on our own foreheads is one thing, but to look around an entire church full of others bearing the same symbol of our Christianity stirs the soul and helps us to realize the gravity of our sins. What a shame if Ash Wednesday became like a fast-food meal: consumed in a hurry and with no lingering impressions. It’s not something we do just for the sake of having done it. Rather, it’s a solemn ritual that should be the beginning of our lasting conversion.